Heavenly Father, you are our hope. We trust in you and your promises. But we admit that at times, like even right now, we sometimes effort with our confidence that you will act in response to our prayers and do what we have trusted you to do with our life. Please fill us with your Spirit and comfort us and kindle our passion that we may serve you with boldness and share with others your grace. 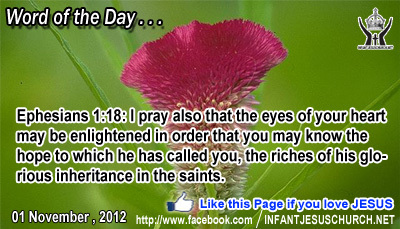 Through Infant Jesus we pray. Amen. The beatitudes which Jesus presents us are a sign of challenge to the world's understanding of happiness and joy. How can we possibly find happiness in poverty, hunger, mourning, and harassment? Poverty of spirit finds plenty of room and joy in possessing God as the most treasure possible. Hunger of the spirit seeks sustenance and strength in God's word and Spirit. grief and mourning over wasted life and sin leads to joyful freedom from the burden of guilt and religious oppression. God reveals to the humble of heart the true source of plentiful life and happiness. Jesus promises his disciples that the happiness of heaven will more than reimburse for the troubles and hardships they can expect in this world. Loving Infant Jesus, increase our hunger for you and show us the way that leads to eternal peace and happiness. May we desire you above all else and find perfect joy in doing your will.